KANSAS CITY, KAN. --- The Kansas City, Kansas Rotary Club, at its October 14, 2014, luncheon, recognized this year’s Public Safety professional from the Kansas City, Kan., Fire Department. 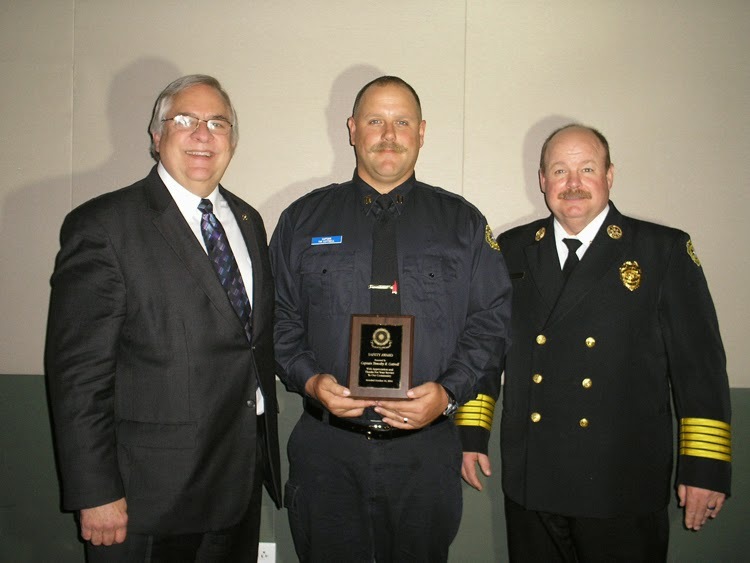 Annually the Club recognizes an outstanding public safety professional from the Fire Department. This Kansas City, Kansas Rotary Club program demonstrates/shows appreciation to the individuals who do so much to protect our community. The leadership of the Fire Department selects an outstanding individual from their department to receive this award, recognizing the individual’s dedication and service to our community. We would like to extend our gratitude to Captain Timothy R. Cottrell. He is a prime examples of the great men and women of the KCK Fire Department who are protecting us every day. Captain Cottrell was introduced by Fire Chief John Paul Jones, who shared highlights of Captain Cottrell’s professionalism and heroism. Senior Deputy Chief Craig Duke, Deputy Chief Mike Wilson and Senior Operations Chief Dave Korosac also accompanied Captain Cottrell and Chief Jones at the award presentation.